The payment methods used by online shops is one of the most decisive factors in the final stage of the buying process for most online consumers. The right payment options can be the difference between success and failure, in that preferences vary substantially from one market to another. Especially in cross-border transactions. For this very reason, most online shops offer several different payment methods to make consumers feel secure and therefore shop more. The two most popular payment methods by far in Europe are debit or credit cards, and Paypal or other payment services. The reason for cards being widely preferred is most likely because European consumers are simply highly familiar with that payment method both in online shopping and in physical shops. Convenient payment services like Paypal are successful because consumers regard them as safe and they are widely offered. These two payment options are the ones that have grown most in the past years, at the expense of other alternatives such as invoice, COD, and payment by installments, which are rarely used nowadays. The relative shares of the two largest options are more or less equal, but the one that is preferred varies from one country to another. In Italy, Germany and Poland, services like Paypal hold a stronger position than debit cards. The opposite applies in the Nordic region, Belgium, and France. 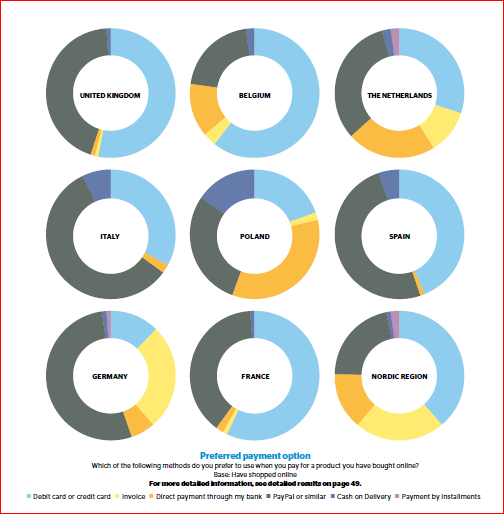 Payment methods are on an equal level in the UK, the Netherlands, and Spain. The option that in general is the third most popular is direct bank transfer, yet this also depends since national options are extremely strong in the Netherlands and Poland, for example. PostNord/Direct Link has conducted studies of the European e-commerce market since 2014, presenting its findings in the report “E-commerce in Europe”. The report is based on interviews with consumers in Belgium, Denmark, Finland, France, Germany, Italy, Netherlands, Norway, Poland, Spain, Sweden, and the United Kingdom. The complete report “E-commerce in Europe 2018” can be ordered free of charge.